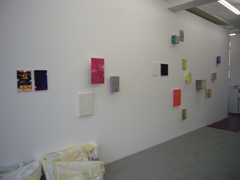 On 4 September 2009 Galerie m Bochum will open an exhibition of recent works by Elisabeth Vary (*1940 in Cologne). 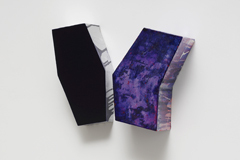 The gallery has been accompanying Vary’s work for the past 20 years, during which her Bildkörper (“image bodies”) have been featured in numerous international exhibitions. Today the artist lives and works in Cologne and in the French town of Corberon. Galerie m invites guests to attend a talk between Elisabeth Vary and Beat Wismer (general director of the museum kunst palast, Düsseldorf) on 17 September that should provide some deeper insights into the artist’s work. Vary’s mostly multi-part, sculptural paintings make reference to one another and repeatedly challenge our perceptual faculties – as we look we discover new things that school our senses and continually surprise us. Velvety and saturated or proliferating expressively, in cool monochrome tones or chaotic abundance, Vary’s colors spread across irregular geometric shapes. Her art explores the dialectical relationships between image, color, body, space and viewer. For Vary, paint is not merely a medium but above all a material with its own body and substance. She emphasizes each color’s intrinsic value, bringing them to life and letting them perfuse the surfaces, yet without ceding control. The artist is the one setting the rhythm, “knowing how paints behave in a certain quantity when allowed to flow” (Elisabeth Vary). Every single plane is an expressive gesture by the artist made manifest. The unaccustomed forms and variety of colors – harmonizing gracefully, jostling aggressively for primacy, or flowing into each other to form something new – stubbornly resist being confined to conventional genres or viewing habits. It takes more than one look to perceive these works in all their complexity. They invite the viewer to enter into a dialogue, one that is set into motion as he walks past. Each change in perspective reveals a new secret and unfurls further facets of these bodies in space.